Papa is at the Autism Center of America (ATCA), home of the Son-Rise Program, attending the Son-Rise Start-Up seminar. Same as the one I attended 7 months ago. Nathan has progressed really well since we started. I can already feel the boost with Papa trainings. He’s excited to get back and go full throttle with Nathan’s and to start Amor’s Son-Rise (daughter-rise) Program. He’s even making sure that along the process, our youngest, Ian, won’t feel left out. 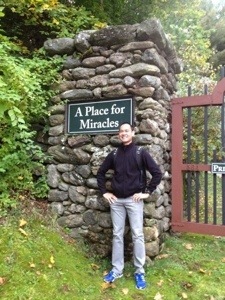 Attached is a photo of Papa at the ATCA gate…it truly is a place for miracles!